So Monday (the last day of the August) I was trying to post the last recipe from August’s cookbook of the month. I was having trouble with my camera and computer and it was taking FOREVER to get the post done. I was getting frustrated to I left it alone and came back to it a few hours later. I hit ‘publish post’ and went to bed. The next day I went to check the blog and my post wasn’t there. I logged into Blogger and there was no trace of the post (usually Blogger saves the posts every few minutes). I was so frustrated. All that work (more than usual) just gone… no where to be found… until today that is! Today when I went to look at a friend’s private blog I saw my personal blog listed on the side bar. And guess what it showed as the title of my latest blog entry “Chicken of the Sea”. I had published my recipe for my cooking blog on my personal blog. Silly me! So blow is the blog entry that should have been published on this here cooking blog for Monday’s cookbook of the month recipe! I love seafood. I love all kinds (except mussels, I don’t like mussels). I actually feel bad for people that can’t eat fish because of allergies. The only bad thing about seafood is how expensive it is. Fresh seafood is usually a splurge around here. But when I saw this recipe in this month’s cookbook of the month, I knew I wanted to make it. The original recipe calls for salmon, so for weeks and weeks I watched the seafood counter at my grocery store hoping the salmon would go on sale. It never did. Then one day last week I was at the store and they had tuna steaks on sale for a half way decent price. I was sold and excited to have a “fancier” dinner and excited to surprise Eric with fresh tuna steaks (tuna is his favorite seafood). In a large bowl stir together all ingredients except tuna and brown sugar. Put tuna steaks into a ziplock bag and pour orange juice/honey mixture over. Let marinate in the refrigerator for at least 2 hours. Remove from refrigerator and let stand on counter for 20 to 30 minutes. Spray a baking pan with non-stick spray place tuna in the pan and pour marinate on top. 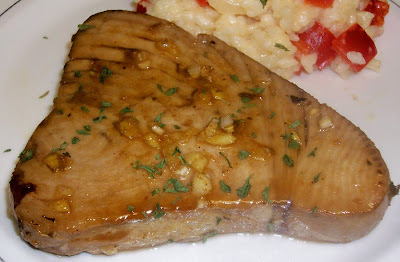 Sprinkle the top of the tuna steaks with the brown sugar. Place under a preheated broiler and cook for 8 to 10 minutes.